Though not formally trained as either a playwright or a labor historian, Nowak has embarked into those specialized terrains as an inquisitive, rigorous poet. To be sure, Mark may well resist this oversimple categorization as a poet—despite holding an MFA and publishing widely in the field of poetry—as it could pigeonhole him in poetry circles whereas he works regularly in labor history circles, speaking widely at labor-history conferences and events. He has also carried out oral and archival research. In any case, Nowak’s cross-disciplinary work is not hampered by a lack of strictly defined expertdom. In fact I’ll argue in this commentary that his work benefits from his inexpert, open-minded stance. An outspoken advocate for labor who has collaborated with unions around the world, Nowak has staged his work in unconventional spaces like union halls, Labor Day festivals, and global-justice events. In April 2009, Davis & Elkins College theatre students in West Virginia performed the on-stage premier of Coal Mountain Elementary. The college is located only 30 miles from where the Sago Mine catastrophe occurred in January 2006 when a coal shaft exploded, trapping numerous miners, twelve of whom eventually died. The performance explored the socio-emotional reverberations the disaster unleashed on this West Virginia community, but it also encouraged the audience to consider how similar disasters are happening in places like China, too, disasters that ravage local communities while serving the imperatives of international capital. This lateral linkage skating across space from site to site is a key facet of Nowak’s political-poetic practice. Importantly, he doesn’t stand on the pedestal of the expert dictating what’s going to happen and when. Instead, he encourages concertedly horizontal, organic collaborations that draw from the experiences of the people he’s working with. Nowak’s cagily sidesteps the tendency to create what art historian and critic Grant Kester calls an “orthopedic relationship” (95) between artist and collaborator, an asymmetrical alliance whereby participants become reliant on the artist to actively administer the dialogue and uncover hidden gems of understanding while the participant assumes a more passive, deferential role. Another example of Nowak’s cross-spatial linkage carried out in horizon fashion is the series of creative writing workshops he did with Ford autoworkers in Minnesota and their co-workers in two Ford factories in South Africa. 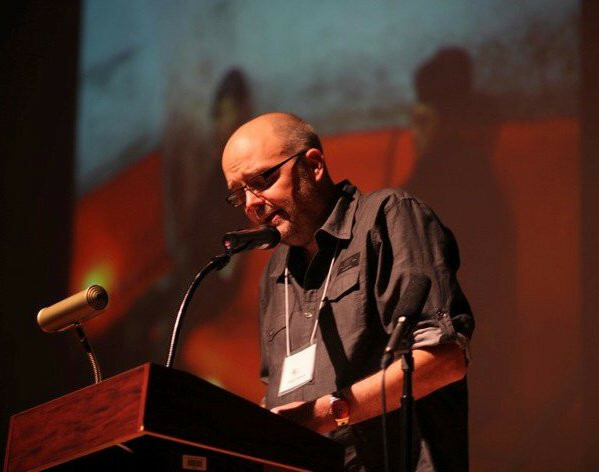 He created what he calls “transnational poetry dialogues” between workers in these seemingly divergent locations, allowing workers to forge meaningful connections and realize shared interests. It began in 2006 in Minnesota where Nowak organized creative writing workshops with United Auto Workers members, helping them to craft poems. The workshops occurred in the long shadow of news that the car plant would be shuttered after 81 years of production. Ford head honchos permitted Nowak to enter the plant and talk about and write poetry with workers between their shifts. Then in August 2006 he traveled with their poems to Port Elizabeth and Pretoria, South Africa where he facilitated extended poetry workshops (a whopping sixteen hours) over a two-day period. Nowak shared the work of UAW poets with the members of National Union of Metalworkers of South Africa, the union that represents South African carmakers. NUMSA members, in turn, responded with their own poetry. Nowak made audio and video recordings of the South African autoworkers reading and performing their work and toted these back to Minnesota where he showed them to UAW members. While US autoworkers tended to resent their counterparts in other countries, to whom their jobs were being outsourced by Ford and other car manufacturers, this “transnational poetry dialogue” put a human face on a process otherwise shrouded in anonymity. Such demystification helped slice through stereotypes and oversimplifications. Nowak does not overdetermine lines of poetic inquiry for workers—he creates interactions where workers can do this for themselves and each other. In 2009 he told PBS News Hour that he’s “trying to find spaces so that working people have a way to voice what’s happening in their lives.” At the conclusion of the poetry workshops in South Africa, Nowak reports a union member said, “This morning our comrade from NUMSA shared with us an article from the Pretoria paper, ‘Ford to axe 6,000 more jobs in North America,’ and in the past we saw only that number. Now, and in the future, we know that one of those 6,000 is [UAW poet] Joe [Callahan], because we have seen them, our co-workers in America, we have heard their voices and read the pain in their words. And we will never see those numbers in the same way again” (20). Embracing inexpertdom does not mean sacrificing rigor. It takes patience, openness, and a real-deal work ethic. The strategic lack of expertise, and a willingness to dive across disciplinary boundaries, can pay huge political-poetic dividends. This brings to mind Nicolas Bourriaud’s comment in The Radicant that artists can help us view “the subject as an object of negotiation” (51). Identities are not static entities petrified in time, but ever unfolding and emergent. Sometimes a concertedly open, inexpert stance can facilitate this unfolding in unpredictable, fruitful ways. Nicolas Bourriaud, The Radicant, New York: Lukas & Sternberg, 2009. Grant H. Kester, Conversation Pieces: Community + Communication in Modern Art, Berkeley: University of California Press, 2004. Mark Nowak, “NUMSA-UAW Poetry Dialogues,” The Autoworker, Local UAW 879, October/November (2006): 20-21. Mark Nowak, “Notes Toward an Anticapitalist Poetics,” Virginia Quarterly Review, Vol. 82, No. 2, (2006): 236-240.